To compete with Google Chromecast, Microsoft unveils Wireless Display Adapter allows substantially to make the same thing: stream content from a mobile device on a big screen wirelessly. Microsoft introduce a new device called Wireless Display Adapter. It allows stream content from a mobile device to a larger screen. Chromecast competitor, it does not use the same technology. Where the device Google works with DLNA standard, Microsoft uses its Miracast technology. The difference is important because the purpose is not the same. When you use such Netflix via your iPad with Chromecast, the HDMI dongle that will download the content and not the app on the tablet; an energy-efficient for mobile device system consumption. Conversely, Wireless Display Adapter (WDA) will in turn replicate the screen of a tablet on a TV. Using Miracast, Microsoft joins the WiFi Alliance, which pushes the standard for years. In fact, the system is compatible with both Android (4.2.1 or higher) OS, Windows Phone (8.1 and above) and Windows at all. However, the principle of the two devices is the same: by plugging the dongle into the back of your TV. Benefit to the WDA He obviously did not require a separate power supply (with Chromecast there is a choice between mains and power via a USB port on the TV screen as in the WDA). 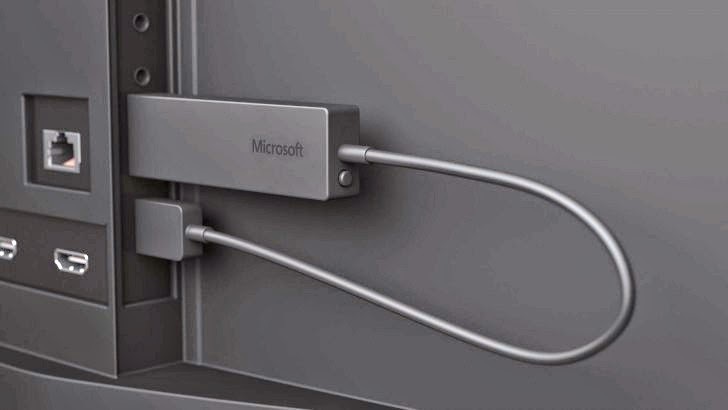 Microsoft's product connects to HDMI and USB on the TV and provides the connection to about 7 meters. Choosing Miracast is quite logical for Microsoft as it also suits the professionals. WDA will be available from October 31 in the United States and Canada for about $ 60, against $ 35 for Chromecast.